Everglades Holiday Park in Fort Lauderdale, made famous by the Animal Planet show Gator Boys, offers fishing and airboat rides in the Everglades. 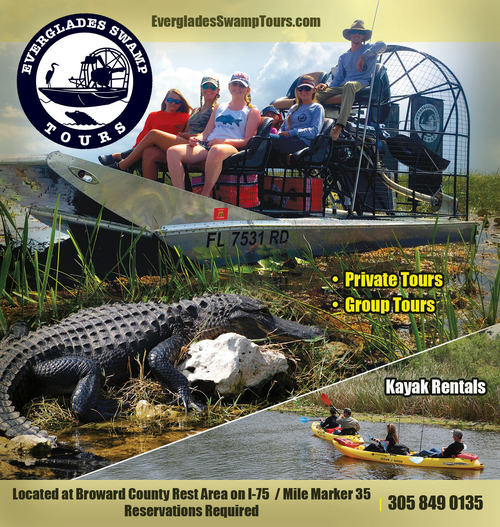 The hour long Everglades tours allow you access to the river of grass filled with all sorts of wildlife. The informative tour guide takes a group out in their covered airboats every 20 minutes. Tickets must be purchased for anyone over the age of 3 but there is discounted pricing for children. After your airboat ride, take in an exhilarating show in their world famous alligator pit. Learn about the nature of the Florida alligator and see some death-defying displays of courage. You may luck out and be there while they are filming a Gator Boys episode or meet one of the stars of the TV show. Aside from the alligators, you can also see and learn about a large number of other wildlife native to the Florida Everglades. Do you enjoy fishing or have an aspiring angler in the family? Check out Everglades Holiday Park's fully-stocked Bait & Tackle Shop and General Store that is open 24 hours to meet your fishing needs including hunting and fishing licenses. Rent a boat or sign up for one of their fishing excursions which include all the equipment you need. See why this area is known as the best large-mouth bass fishing in the world!